This ISR caliper is a bolt on replacement for Wide Glide Evo Harleys and fit “84 to “99 fork legs. They can be used with standard HD discs or matched with an ISR disc for enhanced brake performance. The large 43mm piston diameter provides lots of stopping power. 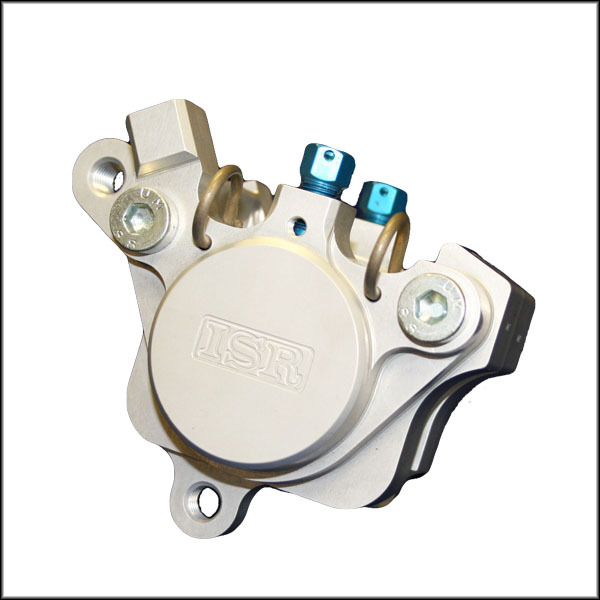 We recommend a 17.5mm master cylinder for a pair of these calipers or a 14mm M/C for single use. Available left and right hand, pads not included (use Ferodo FDB 342 or equivalent pad, 1 pair required). All ISR brake calipers use only DOT 4 brake fluid.Accepts 10 x 1.25 mm Banjo Bolt (not included). Add our Specially Priced Banjo Bolt Kit (includes 1 ISR Stainless Steel 10×1.25mm Banjo Bolt and 2 10mm Sealing Washers) now and save the extra cost of shipping..